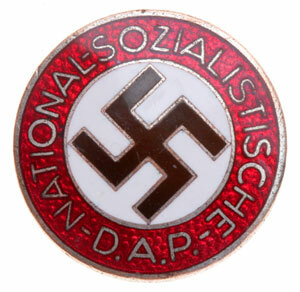 NSDAP Membership Badge: Enameled and nickel plated tombac, 24 mm, M1/42 (Kerbach & Israel, Dresden) RZM; excellent transluscent enamel with no damage, over 90% of plating, light to moderate wear. This is a very unusual and ironic rare maker in excellent condition that needs to be researched!! 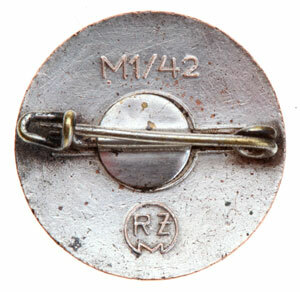 How is it possible for a firm with this ownership name to make Nazi party badges? Did an obviously Jewish partner with the last name of Israel survive the Holocaust? Let's hope he did! Did the factory survive the 1945 Dresden firebombing? If anyone from Europe, especially from the former East Germany reads this, please make some inquiries in the interest of history. Email me as much information on Mr. Israel as you can. Dies ist ein Hersteller, die erforscht werden muss. Hat ein offensichtlich jüdischen Partner mit dem Nachnamen Israel überleben den Holocaust? Hoffen wir, dass er es tat! Hat das Werk überleben die 1945 Dresden Brandanschlag? Wenn jemand aus Europa liest bitte stellen Sie einige Erkundigungen im Interesse der Geschichte. Bitte schicken Sie mir möglichst viele Informationen über Herr Israel wie Sie können.